The children are all in a line, walking with teachers down the sidewalk, looking like they are on an important mission. "We're going to feed the ducks!" they say to whoever greets them. Walking two by two, each holding a teacher's hand they march, looking at all that surrounds them. They pass a store window and one points at the wooden animals. Others are up ahead, looking at the plants and flowers in the pot outside a store. "Soft!" one child exclaims, as she gently feels the greens. "Yes, soft," says her teacher. They continue on, looking at the diorama of people in the window of the dry goods store, and chat with the folks sitting outside the bakery. They stop in front of the bead store and play "I Spy," searching for various objects in the array of trinkets in the window display. This is their town, and they are taking in all of its sights, sounds, and smells. A large dump truck passes them on the street, and two children shout, "Big truck! Very loud!" Their teachers extend their thought process, asking, "Do you know what kind of truck that is?" "A dump truck," answers one young boy. "Filled with dirt," answers another. On they continue, on their mission to feed the ducks. They reach the iron fence, and a teacher pulls bread out of her knapsack. Each child takes two pieces to tear up and toss over, exclaiming as they do so, "Look at that fat one! That's the mama!" "Look at the brown one!" "That one ate all my bread!" "Those two are swimming away!" "That one wants more bread!" They continue watching and feeding until all the bread is gone. As they watch the ducks, the teachers help them understand why the ducks are here, why some have green heads and others brown, why some are fat and some are not, and where they go when the children are not there to feed them. This continues until the teachers share with them that it is time to move on; time to explore another part of town. The children return to their classroom via another route, past the fire station, up the hill past the new wall, and down the alley. This is not a hurried process; rather it is a time for the children to make observations, learn of their surroundings, and ask questions. Upon returning to the classroom, the children continue their questions of how the wall was made, why the truck tires are so big, why some ducks are fat yet others thin. They look at books on trucks and ducks, and they are then provided materials to create what they have just seen. Paper, paint, markers, crayons, playdough, clay ... all are offered to the children to express what they are thinking about, what they have just experienced. Artistic expression is a valuable form of communication. 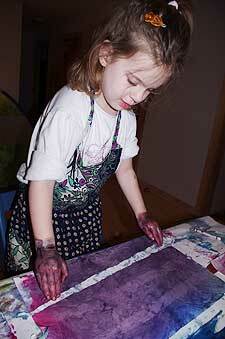 As adults, we tend to shy away from making art, fearing that it will not "look good" or that we are "not creative." Children are not inhibited by others' opinions of what they create. To them, painting a duck or creating a dump truck out of playdough brings their observations to life and allows adults some insight into a child's interests and abilities. The questions that children ask help teachers understand a child's level of development as well as his interests. From these questions, we can fuel the fire by sharing information in ways that children will understand: through art, music, and play. The skills and knowledge gained are much more than about trucks and ducks. Activities and conversation incorporate math, literacy, science, and social skills. It is through this simple act of listening, sharing, and offering activities that children learn. I was talking with a teacher recently who had just set up her dramatic play area to resemble a workshop. When asked why, she said that the boys had expressed an interest in building things, wondering how things were made. She brought in pieces of wood, tools, fasteners, and many things found in a tool shed and let the children explore while working with tools. The kinesthetic experience they got from hammering, sawing, and holding a screwdriver added to their growing knowledge of who works with tools and what they do. Some children wore hard hats, while others drew plans for a house. All children were learning and were engaged in the project, gaining skills in math, science, language, and social domains all in the act of play. When done, the children also drew or painted the results of their accomplishments in the workshop. This was another way to bring their learning to life. It is important to let children explore their world, and to allow their experiences to shape the questions and the conversations that we have with them. From here, we can offer opportunities to grow and enrich their experiences. This should be an ever-expanding cycle, one in which we can all expand our horizons and find a common language of expression. We can find some forms of expression at the 8th Annual Month of the Young Child art exhibit, found at the River Garden during the month of April. The opening reception is on Friday, April 6, from 5 to 7 p.m. during Gallery Walk. 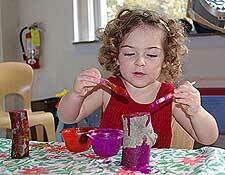 Area early childhood programs will display their students' artistic creations. Fun, hands-on activities, refreshments, and resources for young children and families will be available. For more information about this event, and others during the month of April, go to www.windhamchildcare.org.